Bob Clouser shouldn’t need any introduction to readers, given that he has invented some of the most successful salt and fresh water patterns in history, but unless you subscribe to American magazines like Fly Fisherman, it hasn’t always been easy to find out how to tie his flies. OK, so there is the ‘net, but by definition, such information as can be found lacks organisation. This book solves the problem in some style. Stackpole have always had a reputation for producing polished products and Clouser’s Flies is no exception. The book is illustrated in colour throughout, with fantastic photography that shows the methods involved, the tools, material and flies in great detail. The first couple of chapters cover materials and techniques and then Bob moves on to talk about his patterns and the philosophy that lies behind them. Needless to say, the original Clouser Deep Minnow is first on the list, as it deserves to be, given that precious few patterns work as well for fresh and salt water predators. 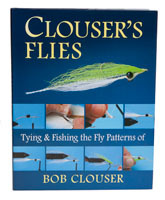 The remaining chapters cover Bob’s other flies, including the Fur Strip Clouser, Rattle Clouser, Half and Half, Clouser Crippled Minnow, Swimming Nymph, Crayfish and a new pattern called the Suspender. The Swimming Nymph is a very effective damselfly nymph pattern and the Suspender looks like a killer for cruising reservoir trout and although the Clouser Minnow was originally developed for use on Pennsylvania’s Susquehanna, trout and pike in the UK recognise it as food the moment they see it, so don’t be put off by the geographical origin of Clouser’s flies – they work wherever you fish them.